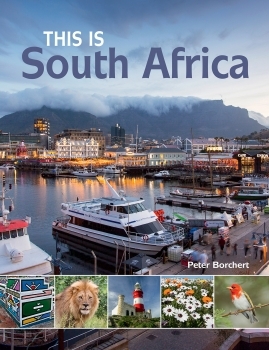 This is South Africa by Peter Borchert, fully updated and thoroughly reworked, takes the reader on a journey of discovery through this spectacular land. It showcases the country’s breathtaking natural splendours and diverse ­flora and fauna, its pulsating cities, the warmth of its people and the intriguing mix of its many cultures. This superb book features more than 300 vivid new photographs, supported by a detailed introduction and informative captions. Borchert has a long and distinguished career in publishing. He is a former managing director of Struik Publishers, founder and publisher of the award-winning magazines Africa Geographic and Africa – Birds & Birding and co-founder of Untold Africa, a website dedicated to conservation, wildlife, travel and environmental debates in Africa. He has written a myriad articles on natural history and the environment and several books on travel and tourism in South Africa. Contributing photographers Jéan du Plessis and Roger de la Harpe represent the finest of South Africa’s landscape, travel and wildlife lensmen. Both have garnered many awards for their work and have published several books in their own right. This is South Africa is published by Penguin/RandomHouse/Struik. ISBN: 9781775845157| RRP: R280.